From the podcast to the page, Lorenzo Flores—co-creator and co-host of the instant success Hacking Your Leadership—finally shares the philosophy that’s made him an authority in retail leadership and management. 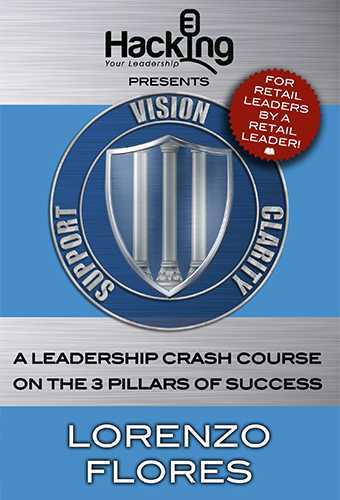 Vision, Clarity, Support: A Leadership Crash Course on the Three Pillars of Success meets all leaders where they stand today and propels them to the next level using the skills and resources that are already within their grasp. Create a team that’s empowered and respected. In return, you’ll see your work environment transform and begin emanating the credibility, productivity, and on-going success you’ve always envisioned. No corporate talk or memorizing acronyms, just real-life examples and thoughts from someone with twenty years of experience who has been through it all, made mistakes, learned lessons, found success, and wants to share their journey to help others. This is the book for leaders, by a leader.